“Alto or discant trombone: . . . the musical quality produced by its small body is not as good as that of the ordinary trombone, which can be used to play equally high parts after steady practice” (Praetorius II Crookes 43). This oft-quoted partial sentence, sometimes used as historical evidence against using the alto trombone, should not be considered a complete representation of Praetorius’s view of the instrument and its performance practice. “Alto or discant trombone (trombino, trombetta picciola): which can play discant parts perfectly well although the musical quality produced by its small body is not as good as that of the ordinary trombone, which can be used to play equally high parts after steady practice” (emphasis added) (Praetorius II Crookes 43; see also original document, above). Why is this initial clause often omitted? Possibly because it muddies the waters. What does the clause mean? Precisely what it says, one must presume: that the alto trombone can play discant parts perfectly well. (Discant in this context can mean simply melody; Terry’s paraphrase, for example, is that Praetorius finds alto trombone “agreeable for playing a melody” [Terry 39]). The reader is obliged to take the clause at face value, like the remainder of the sentence, the two portions tempering each other. Unduly emphasizing the second part of the sentence while omitting the first presents a picture rather less balanced than what Praetorius offers. “But if another clef is used besides the one for the basset and other clefs noted above, it is better to use a sackbut [posaun] together with the cornetts (if an alto sackbut player who plays very well is available)…” (Praetorius III Kite-Powell 159; Lampl 264). Later in the same volume Praetorius mentions alto trombone (alt posaun) in the context of choirs of trombones and curtals (posaunen / fagotten chor), specifically recommending it for the top voice of an ensemble “with six trombones [posaunen], curtals, or shawms” (Praetorius III Kite-Powell 165; Lampl 274; see also original document, facing). Such a specific recommendation would appear to be additional evidence that the author’s opinion of the alto trombone was at least positive enough to advocate the instrument in some contexts. “Not everyone playing in the alto clef on the ordinary tenor sackbut [gemeinen tenor- posaun] can reach g’ and a’ lamire and even fewer on a chorist [double] curtal. If the first part is intended to be played a fourth or fifth lower as an alto, that part must be played either on an alto sackbut [alt-posaun] or treble [single] curtal [Zingel Corthol], that is, a small discant curtal [kleinen Cant-Fagot], or sung by an alto. Above all, one must see to it when composing that no part ascends much more than an octave. Even though some chorist [double] curtal players can play a g’ and tenor sackbut players [tenor-posaunen] can reach an a’—even higher at times—most players generally cannot. 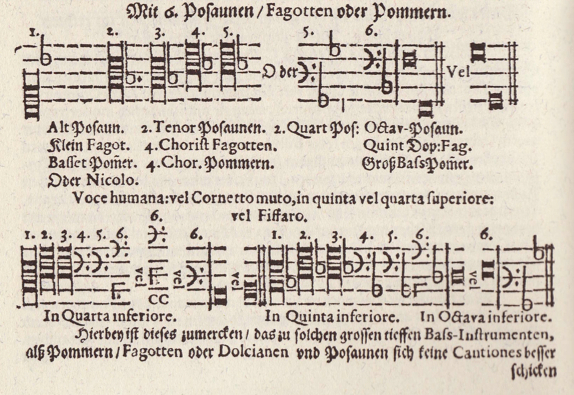 For curtal players the highest note must remain d’, and for sackbut players, e’ (or at the highest, a’)” (Praetorius III Kite-Powell 167; see also original document, above). “Nobody can reach the ‘g1’ and ‘a1 la-mi-re’—in alto [clef]—on a common tenor trombone, let alone on a Chorist-bassoon, when the first part, the cantus, is to be played a fourth or fifth lower, as an alto. Therefore this part should be played either on an alto trombone or Zingel-corthol, which is a little Cant-bassoon, or sung by an alto. But one has to be careful in composing not to let any part ascend far beyond the octave. For although some players manage to go up to ‘g1’ on Chorist-bassoons, to ‘a1’ on tenor trombones and still higher yet, only a few are capable of doing this. Everyone else has to stop at ‘d1’ on the bassoons and at ‘e1,’ at the most ‘a1,’ on trombones” (Praetorius III Lampl 276). This is an extremely important piece of performance practice information, one not traditionally highlighted by scholars, that offers significant clarification of Praetorius’s mixed statement in Volume II of the treatise. In all practicality, most tenor trombone players cannot reach even an a above the bass staff, he says, so most trombonists will need to begin playing alto trombone somewhere in the range of e-a above the bass staff. This practical information tempers Praetorius’s earlier statement from Volume II considerably. In summary, Praetorius offers a mixed, nuanced picture of alto trombone performance practice, saying 1) the alto trombone can play discant parts or melodies perfectly well; 2) however, he prefers the sound of the tenor trombone; 3) nevertheless, there are several specific musical uses for the alto instrument, and 4) most trombonists will need the alto trombone for the upper register, beginning in the range of e-a above the bass staff. Praetorius’s partial statement in Volume II about preferring the sound of the tenor trombone, therefore, should be placed in context, representing as it does only a small portion of the author’s nuanced view of the alto trombone. Praetorius, Michael. Syntagma musicum, Band II: De Organographia. Facsimile edition. Documenta musicologica, 14. Kassel: Bärenreiter, 1958. Praetorius, Michael. Syntagma musicum, Band III: Termini musici. Facsimile edition. Documenta musicologica, 15. Kassel: Bärenreiter, 1958. Praetorius, Michael. Syntagma Musicum II: De Organographia, Parts I and II. Trans. and ed. David Z. Crookes. Oxford: Clarendon Press, 1986. Praetorius, Michael. Syntagma Musicum III. Trans. and ed. Jeffery T. Kite-Powell. Oxford: Oxford University Press, 2004. Praetorius, Michael, and Hans Lampl. A Translation of Syntagma Musicum III by Michael Praetorius. Thesis (D.M.A. ), University of Southern California, 1957.